One of the really interesting outcomes of the last election was the rejection by voters of the Fine Gael strap line: let’s keep the recovery going. As measured by GDP growth, Ireland was rebounding from its period of austerity very strongly, with the fastest GDP growth in Europe. A household sector which had just received an income tax cut, child benefit increases, pension increases, social welfare increases, public sector pay increases (or restorations, whatever), threw the main party’s ‘recovery’ line back in its face at the doorsteps–what recovery, they asked. No recovery here. This was taken to mean that there was no recovery outside of Dublin. Dan O’Brien’s series of columns have dispelled that myth. 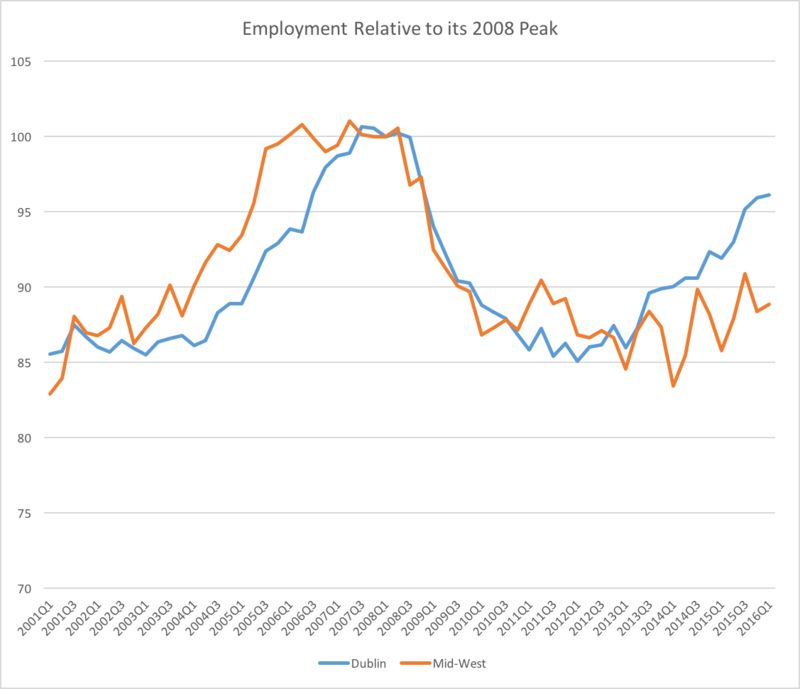 There is a recovery in rural Ireland, it’s just not happening as quickly as in the capital, where employment levels are now 96% of their 2008 peak. In the Mid-West employment levels are at 88% of their peak. Then a long and rambling discussion on the corporate tax element of Ireland’s apparent rebound took place, largely on twitter. The volatility of the corporate tax take in Ireland is exceptional. Yet another strand of the argument is given by thinking about Ireland in relation to Europe. Philip Connolly of the times in Ireland showed me these data of GDP per capita in purchasing power parity adjusted euros compare it with an actual income for consumption measure. The graph below is from Eurostat and shows the difference in the two measures with Ireland and Luxemburg showing a very large difference between these two measures of household welfare. Using the AIC measure, Irish households are closer to Italian than Danish levels of welfare. This may give a clue as to why we see such large differences between official rhetoric and the popular reaction to that rhetoric. (1) With regard to differing population/employment growth between Dublin and the rest of the country, we need to wait until the census results are published. After the 2011 census results were published, population growth 2006-2011 was revised down for Dublin, but revised sharply up for regions outside Dublin. In other words, the 2007-2010 inter-census population estimates painted a more favourable picture for Dublin relative to other regions than was actually occurring (but was not known until after the census). I have no idea if anything similar will happen this time, although I wouldn’t be totally surprised if it did (on a much smaller scale). Having said that, even if there is some revision of this nature, I think its likely that the census will confirm the regional distribution of growth has not been as balanced under the 2011-2016 FG-Lab government as under the 1997-2011 FF government. The 1997-2011 FF government’s record was excellent in relation to distributing growth equally among all regions. Dublin’s share of total population actually fell in this period, while growth in previously neglected counties like Dublin, Sligo, Monaghan etc matched or even exceeded that of Dublin. Among many policies contributing to this was decentralisation, which the Dublin-centric FG-Lab government got rid of. (2) There is nothing especially volatile about the current annual trend in Corporation Tax receipts (although monthly it is volatile). The rapid growth in recent years reflects the reality of the stage Ireland is at in the economic cycle. When recovering rapidly from recession and when unemployment is falling sharply but still high, the balance of power lies with the employers. Profits rise rapidly, but wages lag behind as employees are not in a position to bargain strongly and employers don’t need to raise wages to attract labour. I don’t particularly like this situation, but I don’t see it as a moral issue. I see it as typical for this stage of the economic cycle. As the recovery proceeds and the economy rapidly approaches full employment, the balance of power will shift somewhat and wage growth will accelerate and profits growth will moderate (this will be reflected in changes in the rates of growth of Income Tax, Value-Added Tax and Corporation tax). (3) No one claims that GDP per capita is an accurate measure of living standards. The most accurate measure of that is GNI per capita (measured on a PPP basis). On that measure the trend is exceptionally good for Ireland. It looks like GNI per capita in Ireland was 25% above the EU average in 2015 and 10-15% above the UK level. Relative to the EU and the UK, GNI per capita (PPP) in Ireland in 2015 was back to its record 2007 levels, with every prospect that it will go surging ahead of those levels in coming years. I’ll be very surprised if GNI per capita (PPP) in Ireland is not 50% above the EU average and 30% above the UK level by 2020. As for consumption, it is nonsensical to use this as a measure of living standards. Any country (just like an individual) can consume way beyond its its income by borrowing. A country’s balance-of-payments reflects this. In 2015 Ireland had a balance-of-payments surplus of almost 5% of GDP, while the UK had a balance-of-payments deficit of 7% of GDP (with most other EU countries also being in deficit). In addition, consumption is not the sum total of spending in an economy. There is also investment spending. It looks like the ratio of investment (or Gross Fixed Capital Formation) to GNI in Ireland in 2015 was around 25%, which is way ahead of the EU average. In the UK its 15%. Measured on a PPP basis, it looks like spending on investment in Ireland in 2015 was almost twice that of the UK. While I can see that shifting spending from investment to consumption brings a superficial feeling of well-being to many, economically the greater the share that goes on investment the better and the higher future growth will be. An analogy might be two farmers each with an income of £30,000. One puts aside £10,000 for spending on machinery and buildings, doesn’t borrow and spends £20,000 on consumption. The other puts aside nothing for spending on machinery and buildings, borrows £10,000 on credit cards and spends £40,000 on consumption. Superficially, the second farmer has a better standard of living, but long-term the first farmer has much better growth prospects. With its large balance-of-payments surplus and its high investment to consumption ratio, Ireland is clearly in the position of the first farmer. Disagree with you strongly on (2) and (3) John. On (2), the coefficient of variation of corporation tax for 1984 to 2015 is 70.58 The CV for income tax over the same period is 10. Actual individual consumption adjusted for comparative price levels is a FAR better measure than GDP per capita or GNI per capita for two reasons. 1) Consumption is a better measure of welfare than income in aggregate (but particularly at individual level). 2) GNI in Ireland is inflated by the presence of re-domiciled plcs. Take for example Northern Ireland which has consumption levels far above economic output due to subsidies from the EU and rest-of-UK. Would you suggest that living standards in NI should be adjusted downwards simply because someone else is paying for a chunk of consumption? No. Consumption is a far better barometer of living standards than output is. When it comes to rent-seeking, price-gouging and collusive corruption Ireland is perfectly comfortable wallowing with the other PIGS. In fact, we could probably teach them a trick or two they’ve missed. Sure, ’tis all part of our indefinable charm. As of the end of 2015, employment had pretty much not grown (+0.9%) since the trough in the West region. Plus, the drop in employment from peak to end-2015 was the biggest in the country (-13.9%); it was also over 12% in the Border and Mid-West regions. One thing that struck me about the numbers for the West region is that unemployment had dropped by 6.6% from its peak. Together with the low employment growth figures, it looks like this fall in unemployment was caused by substantial emigration rather than job creation. I can well imagine that those living in this region are baffled by talk of a recovery. Non-sampling error. There was massive intra-censal estimation error between 2006-11 (JTO refers to this above). This is not the CSO’s fault, Ireland has very high internal and external migration levels and no administrative data system to keep track. Household surveys have big limitations in keeping track of migration. So the current (rolling) QNHS sample may be missing households in certain regions and/or over/under-sampling households with particular characteristics. Until the QNHS is re-calibrated with 2016 Census (some time in 2018) we will not know for sure, but by then we will be in the midst of another error cycle. Sampling error can also play a part – the more you slice the data the wider the confidence interval. CSO should publish standard errors with QNHS measures by the way. Actual individual consumption, abbreviated as AIC, refers to all goods and services actually consumed by households. It encompasses consumer goods and services purchased directly by households, as well as services provided by non-profit institutions and the government for individual consumption (e.g., health and education services). In international comparisons, the term is usually preferred over the narrower concept of household consumption, because the latter is influenced by the extent to which non-profit institutions and general government act as service providers. Although GDP per capita is an important and widely used indicator of countries’ level of economic welfare, consumption per capita may be more useful for comparing the relative welfare of consumers across various countries. If we are comparing household income and consumption figures, arguably it’s worth adjusting for household size. A household of two does not have a 50% higher living standard than their neighbours who have an identical income, but who have one child, although in per capita terms, they do. According to Eurostat, the average household size in the EU28 is 2.3 (2014). In Ireland the comparable figure is 2.7. In Sweden and Germany it is 2.0. Generally household size declines as you go north. 2.7 is 17% above 2.3, and 35% above 2.0. 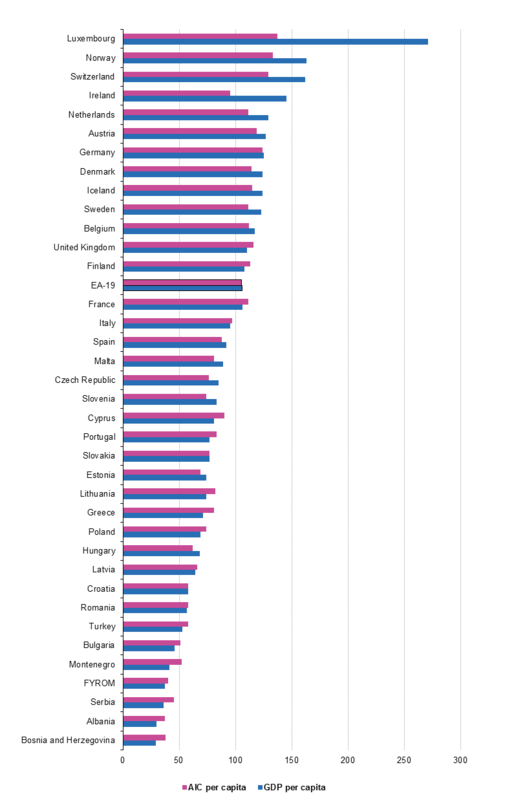 Even a partial restatement of the per capita figures to recognize that not all household consumption is a fixed cost would have the effect of bringing several countries closer to the EA19 average. Just from eyeballing the AIC chart, Ireland would probably move to on or about the average. One of the most interesting aspects of the Eurostat material is that it makes a stab at explaining the special circumstances impacting Luxembourg but does not attempt to do the same for Ireland. These latter circumstances could be summed up under three headings (i) FDI which makes GDP a rather useless measure (ii) the freedom with which the Irish choose to emigrate, coupled with the dramatically rapid rise in the immigrant workforce (mainly from Poland), making the capture of reliable data almost impossible and (iii) developments which predate he crash e.g. the decline in certain small towns because of the dominance of car ownership, changes in shopping patterns etc. (as identified by Colm McCarthy). The more rapid development of the Dublin region is entirely in line with what has happened elsewhere. Regional policy attempts to counteract such economic concentrations have been marked by one thing; failure. The one action that might help in Ireland would be to flesh out the motorway network e.g. to JTO’s area of the island and between the medium sized towns in the form of an island wide M50. Fat chance! Perhaps we have entered a post-fact world, where people believe things to be the case and refuse to accept any contrary evidence. Everyone can now air an opinion via social media and traditional media encourage feedback , so one person’s view is deemed to be equal to another’s, regardless of the factual accuracy of any comment. During the election some broadcasters deemed any mention of Fiscal Space to be verboten as it was ‘boring’, even though it provided a simple and illuminating snapshot of the main parties approach to spending and taxation. We see this disregard for factual support in Trump’s campaign and in the Brexit debate. On the AIC measure, I recall the Nevin Institute posting some charts, but a good while ago now. The AIC/GDPpc gap is surely a further sign of the hard-to-interpret-ness of our economic data. Great point Cathal—how would we measure the ‘google’ effect you describe here? Taking a look at the figures, the ratio AIC : GDP for Ireland is about 30% lower than Denmark, to select a comparable country. What’s happening to the 30%? Good question. But, as Cathal Guiomard points out above, Irish economists find it very, very difficult to interpret a lot of Irish economic data.